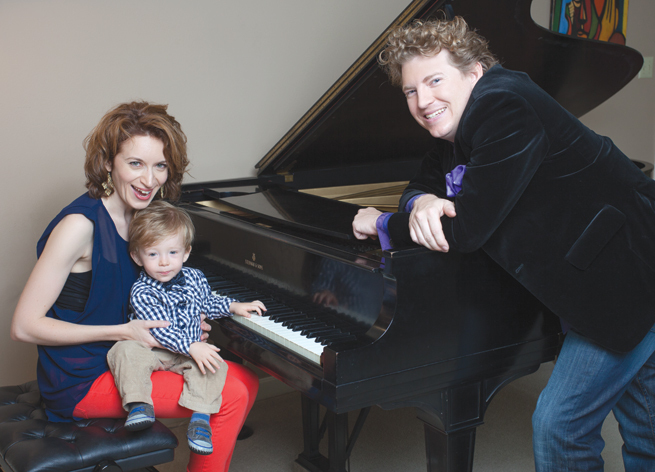 For the October 2013 issue, Little Rock Family sat down with musical couple, Philip Mann and Tatiana Mann to talk about their passion for music education, Philip’s work with the Arkansas Symphony Orchestra, and how life has changed since the birth of their son Julian. Music sweeps through the Mann home in west Little Rock. It’s not a recording of a great symphony reverberating through a set of speakers. It’s not Tatiana Mann, an accomplished pianist and professor at UALR, rehearsing. Nor is it Philip Mann himself, the conductor of the Arkansas Symphony Orchestra, preparing for an upcoming performance. 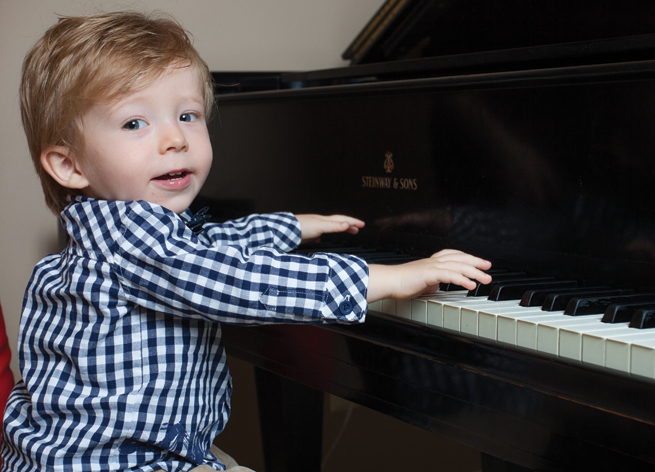 It’s the clunk and plink of 19-month-old Julian Mann testing out the keys of the Steinway B in the living room. “That’s one of the reasons for music education right there” says Tatiana, laughing at Julian as he gleefully bangs away. These days, life is a little different for the central Arkansas transplants, who previously traveled the world creating music and “paying their dues,” as Philip says. 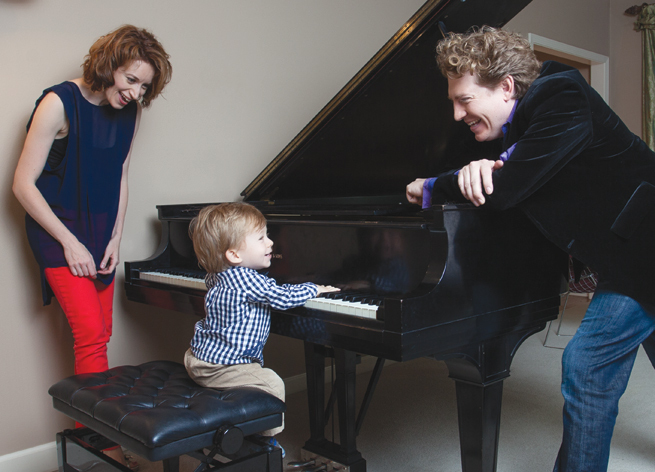 But some things haven’t changed with the addition of little Jules to the family: Philip is conducting the Arkansas Symphony Orchestra for his fourth season, and the popularity and success of the organization continue to grow; Tatiana still performs around the state, teaches students at the University of Arkansas at Little Rock and offers private lessons to children; and the couple is as passionate as ever about classical music and power of music education. Tatiana Mann: A lot of people come up and say “Were you one of his groupies? Did you meet after a concert?” I was not a fan! We met in college. Philip Mann: We first met at a tea that was held for scholarship students. But we got to know each other playing concerts together. I was amazed by her musicianship and how accomplished she was on the piano and how passionate she was. I was in awe of her and asked her to play a few concerts with me. TM: It was so funny, because I think he was trying to impress me. He figured out I was from Eastern Europe, so he told me all about how he traveled in Western Europe and lived by himself and went here and there. He wouldn’t shut up about how much he traveled in Europe. And I was impressed! PM: What can I say? Tatiana stood out around school as one of the most promising musicians, but she’s obviously very beautiful. I was trying to impress her, I admit it! TM: The first half of Julian’s life was us trying to survive the sleepless nights. But now we get to take him to the pool. We’ve taken him to Hot Springs, and visited Crystal Bridges twice. Traveling with a kid adds another dimension, but we do try. And I work, so trying to balance is difficult. My music and teaching at UALR are very important to me, so at first it was trying to be a good mother and be a professional. I love music. It defines me and has defined me for a very long time. PM: One of the overwhelmingly positive things we were happy to discover in Arkansas is how family-friendly the state is—cost of living, quality of life. It’s such a supportive, warm, generous place to raise a family when it comes to your neighbors and community. We have moved around and lived all over the world, but we never felt at home so quickly or had so many friends who were so supportive as we immediately felt here in Arkansas. TM: And Julian’s preschool, Second Presbyterian Preschool, is amazing. They take great care of Jules and are very observant, loving and caring. I wanted my child to be in an environment where I felt the people were nurturing. PM: I always talk in music about how people bring their life experiences to their music making, and how everything from travel to trying new cuisine can inform their artistic endeavors, and being a parent has certainly been the most profoundly changing life experience for me that made me look at the world differently. I’d like to think that it helps me be a better musician and bring another perspective to my work with the orchestra. TM: By nature I’m not a playful person, and having a child inspires me to be more playful and more creative. I mean, when was the last time you finger painted? I think I had more fun than he did! He is a blessing. One of the things we hope to preserve about ourselves as musicians is that wonder about the world. A child does that—discovering everything for the first time. I can’t count how many times he says throughout the day “Wow!” I think that’s wonderful. PM: I can’t wait until he’s at the age where he can start asking questions. Right now, Tatiana speaks Russian to him, and I speak English to him, so we’re hoping to raise him bilingual. But one of the effects of that is his language development is a little delayed at the beginning. So we’re not having full conversations yet. PM: I think that the most inspiring thing that I’ve seen at the Arkansas Symphony Orchestra has been the growth of our audiences and how more young people have been engaged with the symphony. Our free Entergy Kids’ Ticket program has allowed our Sunday afternoon crowds to really look like Arkansas, where we have people of all ages from all different backgrounds attending the symphony. The Executive Director Christina Littlejohn, our Director of Education Barbara Burroughs and I feel strongly that music, and orchestral music, should be for everybody. It never was intended to be an elitist art form or something for the rich. I particularly love doing concerts for kids because they come into the concert hall without any baggage. They don’t have any preconceptions or pictures of what a symphony-goer should look like. They’re just in amazement of the concert hall and this incredible sound in front of them. So without any of the stereotypes or preconceptions, they’re a blank slate. That’s easy for us, because our art form is so incredible and so amazing and it changes lives. It’s easy to get kids hooked when they have an experience like that. From the orchestra standpoint, the tremendous artistic growth we’ve seen and the amount of work and energy that musicians have put in over the last three years is extraordinary. And I count myself as very privileged to be a part of this new chapter in the story of the Arkansas Symphony. PM: It’s quite profound and incredible to know the depth of which music education can change the potential of a person. The Arkansas Youth Orchestras are the main way that we connect with a lot of young people. We have four youth orchestras right now that students from all over Arkansas are represented in. It’s a growing program that allows students, particularly those who might come from school districts or homeschooling that don’t have access to an orchestra, to have an ensemble experience. And those who do come from a school with a band, they have that additional experience maybe at a higher level, working with similarly committed and talented young artists. 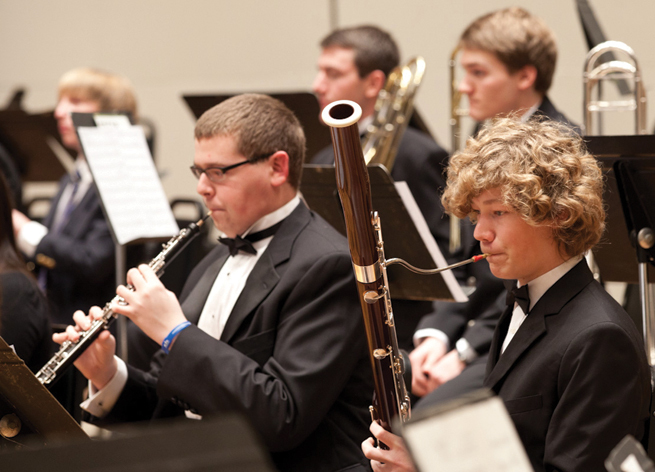 The Arkansas Symphony Orchestra has such a myriad of programs, between the Youth Orchestra, the Children’s Concerts, the ASO Quartet Demos all around the state, and then our musicians do classes and coaching at programs around the state. Ultimately the goal of all our education programs is not to build future audience members to buy tickets. It’s to increase the chance that a young person will take up an instrument and ultimately have music as a daily part of their life. It’s not even to create the next generation of professional musicians. It’s just to create the next generation of great, whole successful people who have daily art experiences built into their early childhood. TM: From a parent’s perspective—yes, I’m a little bit biased because we’re professional musicians and this is our life—but we hope to raise a well-rounded individual. Of course, there are plenty of statistics about learning an instrument affecting math skills. But we’re also hoping to raise a well-rounded individual who has a soul. I do have to say that it’s the complexity of music that really develops the mind and widens people’s horizons. It’s like eating different food—it expands your palate. Why is reading so important? If you can’t travel somewhere, you can read a book. I think music does the same thing for the soul and the same thing for the mind. PM: It’s quite astonishing if you look at the effects of music education on a kid’s potential. It really should transcend politics and political discussion of education funding. If you put music education into a school, you’ll find the academic achievement of the school is radically raised by measures of standardized test scores. Future income potential is dramatically improved by someone who has an arts background. Children have higher standardized test scores, higher SAT scores, they go to better schools. They’re often more physically fit because they’re more active and engaged in social situations. You can actually see the changes of the brain structure. Musicians who have studied piano or violin at an early age actually have a 12 percent thicker corpus callosum, which is the connecting pathway between the left and right sides of the brain. The other thing would be social success, where participating in music allows people to increase in empathy and social skills, language skills, referential memory. In music, things are right or wrong. It’s in tune or it’s not. It’s the right note or the wrong note. And having the discipline to work at something for years to do it right and to be excellent at it, that’s a great gift to give a child—to have discipline and a sense of quality. That’s the most important gift that we’re giving him, other than a loving and supportive home. Music can be something that he has as a part of his life for his whole life.